Have you ever been during dusk and sunset viewing Singapore from the sea? 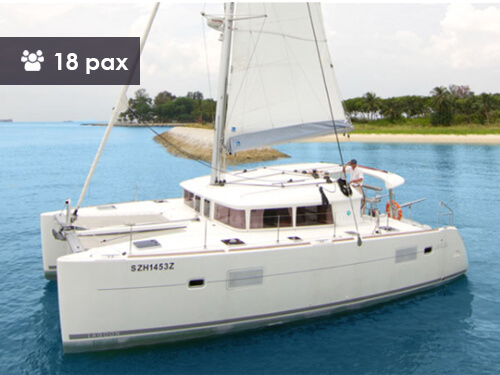 It is an amazing experience that you can make when chartering our luxury boat in Singapore. We sail along the southern coast of Singapore and Sentosa Island befCruisingRouteore heading to Lazarus Island. We drop the anchor in the beautiful secluded bay where you could enjoy your lunch or BBQ and relax on the white sand beach. Subsequently, we will sail around the islands of St. John’s, Sisters’ Islands and Kusu and drop anchor there for further relaxation opportunities. About 4 hours later we will sail back towards the west in between some of the moored tankers around Singapore’s harbor area before we return to the Marina. Outdoor enjoyment includes 2 kayaks, snorkeling gear, dingy for beach excursions as well as a wide trampoline at the front bow for guests to sit on when Sunrise is underway. Guests may even sleep on the trampoline at night! With a very shallow keel, Sunrise may go into shallow water closer to the beaches. Sunrise also have a motorized dingy which can ferry people, food, and gear to the beach for lunch or a sunset dinner. 3 Snorkeling kits without flippers (on request)|3 Fishing rods (on request)|Dingy/tender boat ($150 per hour of usage fee)|Trampoline net allows 360 degrees panoramic view!|Built in Cooler box onboard with 80 cans capacity.